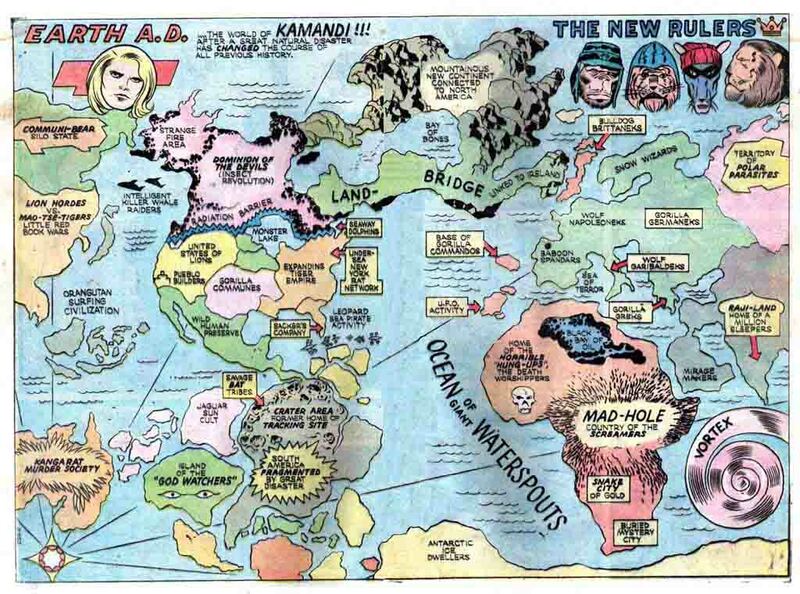 Topographic Tuesday – Kamandi’s Earth A.D.
Today’s Topographic Tuesday is a “Two-Fer.” Earth A.D. is more than just the title of a really kicking Misfits song. It is also the name of the alternate future world created by the King himself, Jack Kirby, for a DC comic called Kamandi, The Last Boy on Earth. It is a world in which animals have evolved into intelligent bipeds and humans have become their prey. The title character is a long-haired Aryan youth who becomes sort of a post-apocalyptic Nat Turner when he turns on his lupine overlords. 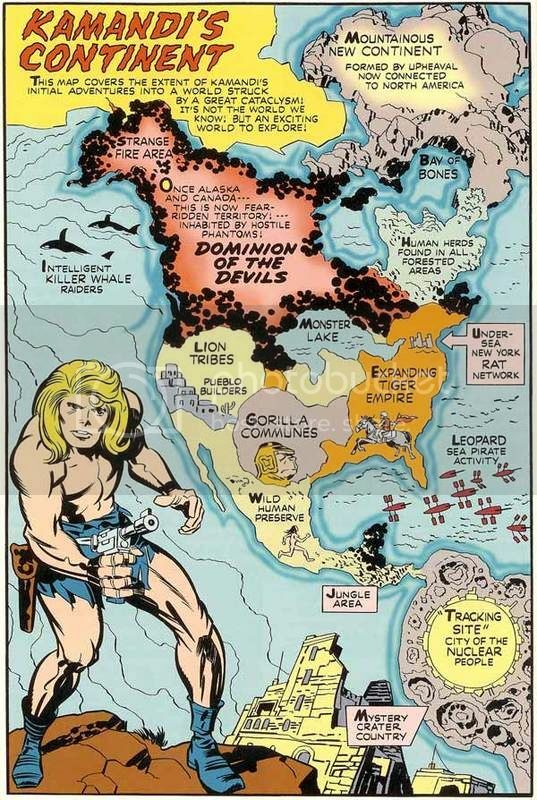 The first map, pencilled by Kirby and inked and lettered by Mike Royer, appeared in Kamandi No. 1 as a one-page feature: “Kamandi’s Continent”, covering the area of North America of the alternate future. As a kid from a conservative family in the Expanding Tiger Empire whose favorite comics were Captain America and Sgt. Rock, I wasn’t that crazy about that straight-outta-Haight-looking Kamandi kid, even if he was drawn by Jack Kirby. My favorite character was Captain Pypar, a Bulldog Brittanek. Imagine Richard Sharpe crossbred with UGA, the University of Georgia mascot. The redcoated epitome of Brittanek stiff upper flews. If I ever run a Gamma World game again, this is the campaign map I’m going to use.